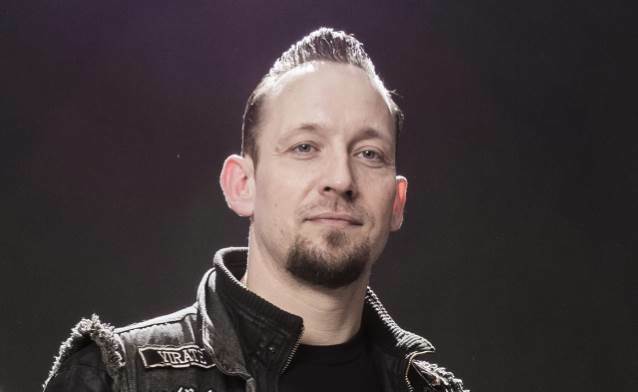 Prior to VOLBEAT's May 29 performance in Manchester, United Kingdom, singer/guitarist Michael Poulsen spoke with Heavy TV. The full conversation can be viewed below. A few excerpts follow (as transcribed by BLABBERMOUTH.NET). Michael: "We've been out on the road many times with METALLICA, and each time, it's been a pleasure and a great experience and lots of fun. We finished that stadium tour with METALLICA in the U.S., went back home to Europe and did our own headlining stadium tour and took a half-year off. I just got a baby daughter one year ago, and at the same time, I used a lot of time writing new material. So, I've been home being a dad and at the same time writing new songs. Of course, you need to reload your batteries. At least, you're home, so you're comfortable when you sit and write. Everything's been quite smooth." Michael: "Definitely next year. We are planning to hit the studio around late November to record some songs. We might enter the studio again very early next year to record the second half. The album is going to be out next year; I just don't know when. But it's going to be out next year." Michael: "Right now, it's all VOLBEAT songs. I do have things at home — I can pick up some few death metal riffs here and there. 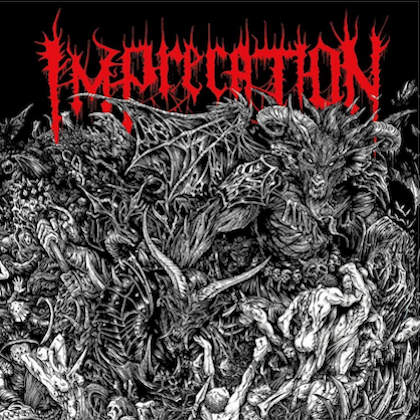 I've got so many good friends in the death metal scene, and I've been talking to some of them to one day, when the time is right, sit down and write some old-school death metal. When that's going to happen, I don't know. It will happen; it's just timing is everything. But so far, I'm concentrating on writing those new songs for VOLBEAT." Michael: "Our management, they thought that it would be a good idea to do an English version for the U.S. market. We thought, 'Well, okay. If you think so, why not?' But it actually turned out [that] everybody, even the Americans, like the Danish version better. Now they can get both versions, which is fine. When we play it live, we play the Danish version, because for us, that was the way it was meant to be, and it seemed like no matter where the audience comes from, they like the Danish version the best too, so that's the version that we are playing. We tried both versions, and the Danish version has always been the one that people like the most. It brings something special to the table when we do it in Danish." Michael: "We always just pick one, and if it works in the rehearsal room, then we record it. That's the way to do it. We've been talking a little bit about if we should do another cover version of something. We always end up doing something, but right now, we really don't know, so let's see what happens." Michael: "I started out in a death metal band growling and playing guitar. It was quite easy for me to do that. It got more complicated when I started singing for some reason. I'm not taking anything away from the death metal singers, because I've been there, and it's not easy. You have to have a certain talent to be a good death metal singer. There's just some technique that [is] a little bit more difficult when it comes to singing and playing guitar at the same time. There [are] riffs that are more easy to sing on top of than others. Sometimes, when I'm sitting and writing, I'll be thinking, 'Man, why am I playing a guitar? I should only sing on this track.'" Michael: "Rob is a really talented technical, skilled guitar player. I think what he brings to the VOLBEAT sound is something I've been looking for for a very long time. It adds something, and it still sounds like VOLBEAT." VOLBEAT's upcoming follow-up to 2016's "Seal The Deal & Let's Boogie" will mark the band's first full-length effort to feature bassist Kaspar Boye Larsen, who joined VOLBEAT too late to appear on the last CD. "Seal The Deal & Let's Boogie" was released in June 2016 via Republic Records. The album featured the single "Black Rose", which landed at No. 1 on Billboard's Mainstream Rock Songs airplay chart. It was the second track from the disc to top the list. The LP's first single, "The Devil's Bleeding Crown", reached No. 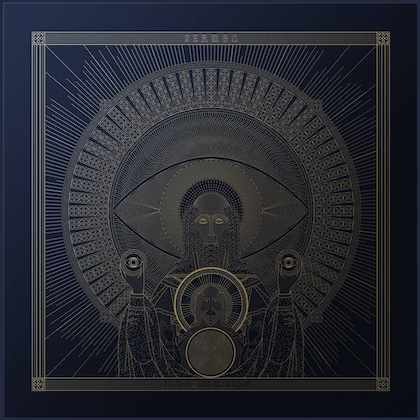 1 in May 2016, while the follow-up single, "Seal The Deal", got as high as No. 3 in December 2016.